The commercial market is engaging with renewable energy like never before. Projects large and small are investing to reduce the carbon footprint of both new and existing buildings. Heat pumps are a popular choice, particularly where the site is off the gas grid. As a manufacturer of heat emitters, we are watching this development with great interest and a certain amount of frustration. Through lack of imagination or product awareness, the energy savings available from heat pumps are not always being achieved because they are routinely paired with over-sized radiators, rather than a heat emitter that will perfectly complement and support the optimal performance the heat pump has been designed to deliver. I am, of course, talking about pairing heat pumps with fan convectors. Whether instead of or in tandem with underfloor heating, they have the energy-saving credentials to deliver the SAP ratings that the heat pump is capable of, and to ensure clients get the long-term cost-savings and energy reductions they have invested in. For the same heat output with low water temperature, a fan convector is much smaller and lighter than a traditional radiator. Standard radiators are much slower to heat up and cool down than fan convectors because they require more water at higher temperatures, as well as a large surface area to effectively use convection to heat a room. 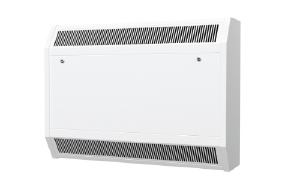 In contrast, a hydronic fan convector will use around 5% of the water content of an equivalent output radiator. By using forced-air convection, via a small and energy-efficient electric fan, they circulate heat almost immediately. This means they are also more responsive to changing weather, as well as someone’s own temperature preferences. It also means fan convectors can function very effectively at water temperatures below 45°C, which are the best water temperatures for heat pumps to work at optimal efficiency. Radiators, in comparison, work best with water temperatures at about 70°C. While they can just about perform at a temperature of 45°C, they have to be significantly larger, while their performance and heat output is understandably greatly reduced. To underline it further, using radiators of any size with a heat pump will reduce the heat pump’s efficiency by more than 10%. There has been compelling independent research that has shown just how energy efficient fan convectors are, when paired with heat pumps. One example SAP (Standard Assessment Procedure) calculation shows that employing an air-source heat pump and fan convectors in a new build should create at least a 12% reduction in running costs and carbon usage compared to radiators and an air-source heat pump. Remarkably, using fan convectors will achieve close to the efficiencies achieved by installing under-floor heating. This information is easily available. 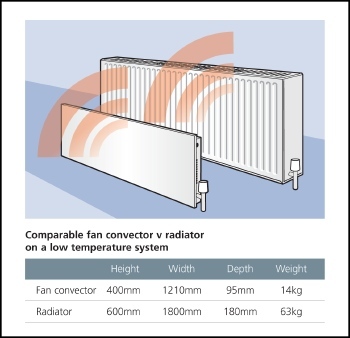 Download the MCS 021 heat emitter guide* and note where it states, ‘A fan-assisted radiator (fan convector) will have a higher heat output than a standard radiator the same size. You can therefore achieve a higher Temperature Star Rating without the heat emitter becoming too large for a room with a fixed specific heat loss.’ In other words, the performance of heat pumps will be at an optimum if installers choose to use low-temperature heat emitters to transmit heat. So why aren’t heat-pump manufacturers and fan-convector manufacturers, for that matter, shouting this from the rooftops? The short answer is, they are. However, it is still hard to go against conventional wisdom in the UK that equates central heating with radiators. There are still myths in the market place that perpetuate about fan convectors, and as manufacturers we have to do more to fill the information gap as well. Stepping away from conventional wisdom is never easy, and yet the benefits to clients are abundantly clear. The low water content of fan convectors makes them much more responsive than radiators. Our own experience is that once fan convectors have been specified on a project and an installer has worked with them, they never look back. It also provides a commercial edge. Offering a different product choice and bringing clients new ways of thinking about their heating project makes specifiers stand out as distinctive and insightful. There are other benefits for specifiers to select fan convectors for their renewable-heating project. The most obvious one is the fact that you can site them anywhere you please. Again, conventional wisdom places heaters against the wall, low on the ground. With fan convectors, while this is an option, it is only one of many. Fan convectors can be high on the wall, above doors, in the floor, on the ceiling or even recessed into walls, ceilings and floors or concealed completely, depending on the fabric of the building, the overall aesthetics or function of the rooms. By selecting fan convectors — and modern fan convectors are quiet, discreet and easy to install — the flexibility on the heating project significantly increases. At Smith’s, we are investing heavily in our commercial offering because we can see the opportunities all around us for products that are not only functional and high performing, but are also aesthetically pleasing, cost-effective, responsive and easy to control. We believe that as the renewable-energy market grows, fan convectors will be paired more consistently (and logically) with heat pumps and with other wet renewable heat sources, and this can only benefit the carbon footprint and energy conservation in the UK generally. Jim Bennett is sales and marketing director with Smith’s Fan Convectors.